I love The 69 Eyes in theory. I love the look, I love the sound, but their albums are so spotty. For example, “Dead Girls Are Easy” is one of my favorite songs from them but the rest of the Back In Blood was complete filler. When I found out they had a new album called X coming out in 2012, I heard one or two samples and still wasn’t impressed so I didn’t bother tracking it down. After listening to the Love Runs Away EP, maybe it’s time I do find a copy. I like all three songs on this EP. 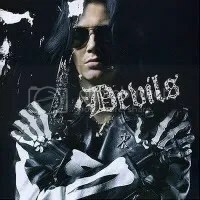 “Love Runs Away” is classic 69 Eyes — hard driving goth rock with a 1980s vibe during the chorus, “Dracula’s Castle” has a 1960s lounge lizard/surf rock vibe to it while “Rosary Blue” is a ballad and duet with Kat Von D.
The duet with Kat Von D is my favorite track here. It’s very haunting and immediately makes me think of the soundtrack for 1994’s The Crow movie. An extended version of the song is available exclusively on iTunes. All told, this EP features three very good tracks that makes me think I shouldn’t give up on the band just yet. 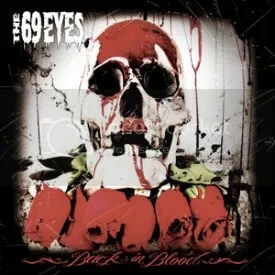 The third 69 Eyes album I’ve heard very well may be my favorite! It’s not a concept album, but there is a loose theme of vampires throughout… Not surprising considering the bands refers to themselves as “Helsinki vampires”. “Dead Girls Are Easy” was unleashed months ago online and it’s easily one of my favorite songs of the year, just so extremely catchy and rockin’. The lyrical content disturbed my woman, but it’s all in good fun to me! Nothing else comes close to matching the power of that song, but the rest of the album is still good. The 69 Eyes’ self-proclaimed “goth ‘n’ roll” style of rock has a bit of a harder edge this time. Keyboards are mostly out and so is most of the poppy writing, now it’s just down to the guitars. All of this might have to do with Matt Hyde producing (he’s produced Slayer and Monster Magnet). It’s a good direction for the band to get a bit heavier. I’m not sure how this will go over with longtime Eyes fans, but I’m enjoying it and this one of the top releases of 2009 for me. But, truth be told, I can’t claim this is their best album (of the two I’ve heard, that is!). Angels is pretty superior, in my opinion. There’s nothing here that immediately jumps out at me as instantly catchy ‘goth ‘n’ roll’ like “Perfect Skin” and “Never Say Die” did. It’s still a good album though, but it took a few listens for it to grow on me. The difference between Angels and Devils is that this album seems a bit more caught up in 80s synth and 2007’s Angels was more of a harder rocking effort. “Beneath the Blue” features HIM frontman Ville Valo on vocals. I wasn’t aware of this band until browsing thru Best Buy’s sad music section and this album cover (along with their Devils album cover) popped out at me. The band looked pretty cool, but there was a lot of sticker hype on the wrapping talking about goth metal and such and while some of that music is okay, listening to a whole album becomes tiresome. So I didn’t bother picking either up (if only Best Buy had listening stations…). Eventually, I got around to checking their MySpace page and loved some of the songs on there from this album. “Perfect Skin” is a really catchy song, so catchy I’m surprised it wasn’t at least a minor hit here in the States. “Never Say Die” would by my second favorite song, but it’s a bit comical because Jryki 69 has that Danzig/Peter Steele/Dracula kinda voice going, so it’s hard to take too seriously sometimes. My girl even commented that “he sounds like it’s Halloween or something”. She likes the music, but doesn’t like his voice, and from reading reviews of the band, apparently many others feel the same. I really don’t mind it too much, I think the songs would probably sound better with someone who wails like a hair metal front man, but at least its unique and not something you hear everyday. That is, unless you listen to The Misfits, Danzig, “Monster Mash”, and Type O Negative everyday! Overall, I really like this album. It’s really catchy and not so over dramatic as many goth acts can be. “Wrap Your Troubles In Dreams” is a re-recorded version of their song from their 1997 album of the same name. I think it’s a U.S. release exclusive. Fun Fact: The 69 Eyes were originally a glam metal act, before converting to goth metal in the late 90s, though they are self-described as “goth ‘n’ roll”. Which, I agree with somewhat, they are harder and have more of a rock ‘n’ roll spirit than most goth bands I’ve listened to (obviously owing this to their glam metal past).